The details for the international commission of inquiry into the case of the ‘Miami five’ to be held at the Law Society next month have now been finalised. The intention of the commission is to highlight the case of the five who were jailed for espionage offences. Their defence was that they were seeking to prevent terrorist attacks in Cuba by infiltrating anti-Castro groups in Miami. They claimed they were unable to receive a fair trial because of the anti-Castro atmosphere in Florida. The Miami five, sometimes called the ‘Cuban five’, are Gerardo Hernández, Ramón Labañino, Fernando González, Antonio Guerrero and René González. They were arrested in Miami in 1998, held in solitary confinement for 17 months and charged with conspiracy to commit espionage. Following their trial, they were jailed for terms of between 15 years and life. 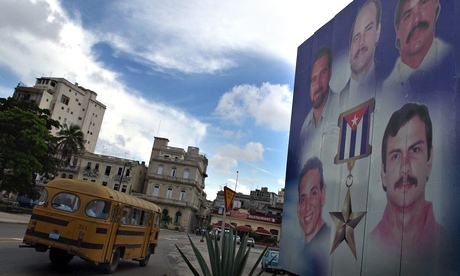 Their case is a cause celebre in Cuba and parts of Latin America. The inquiry will take place from 7-8 March and will be open to the public. The commission will be comprised of a team of international jurors including the former chief justice of India, Yogesh Kumar Sabharwal, the former justice of the South African constitutional court, Zakeria Mohammed Yacoob, and Philippe Texier, a former chairperson of the supreme court of France. According to organisers, around 20 people will give evidence, including the US defence attorney Martin Garbus, representatives of Amnesty International, and relations of the four men still inside. Alice Walker, the Pulitzer prize-winning author of The Color Purple will also be present. The international commission has the support of John Le Carré, Emma Thompson, Danny Glover, Lord Rowan Williams, Martin Sheen, Noam Chomsky, Günter Grass, Peter Capaldi and Dame Vivienne Westwood. In an associated event at the Barbican, in London, the Cuban musician, Eliades Ochoa of the Buena Vista Social Club and his group Cuarteto Patria, is performing.